Hintertux (10 lifts running) is as always in fantastic shape! Good winter skiing is also found at Kitzsteinhorn - Kaprun and Molltal Glacier ( 3 lifts). This information might have changed since we have published it, so it is recommended to contact the Austrian Tourist Office before travelling or get more recent information at the official website of the particular ski resort you are planning to visit. Hintertux Glacier - the Eternal Ski Area! The ski season formally spans from May 13th 2018 to May 12th 2019. Even if we do not plan for a great vacation, Hintertux is a particularly suitable choice for skiing and snowboarding. The resort is extremely popular among weekend visitors. The winter sports area is in large limits, between 1500 and 3250 meters, it is for everyone. The glacier has been awarded the Skiresort.de portal for the winter of 2018 as the world's leading ski resort with up to 60 km of slopes. The European Freeheel Championship is the 28 km snowball on Hintertux. It is 150 years ago that the Telemark ski discipline. Running, jumping, turning with flexible alpine skis implies descent into unmarked areas, away from the slopes and high resort fees. meeting the challenges of wildlife. Even if you do not hit the specific dates of the sporting events, it does not mean you can not find your first teacher or sport the individual telepaths. Nature Ice Palace is a mosaic of an unfamiliar frozen world. Performances such as huge stalactites, crystals, cathedrals, waterfalls, the lake, the giant Tuxer Riese are expressive enough to be seen. 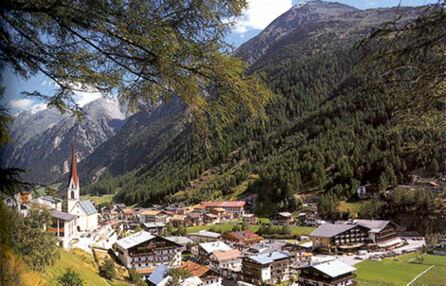 For accommodation matters search: https://www.austria-trips.com/hotels/htm. Mountain triathlon The Albert Adler 2019 - three competitions, one winner. If you are eager to attend the ski run The White Rush you must show up in April, more exactly on 21st 2019.As for the Semi-Marathon "Jakobilauf", it kicks off on July 27th, and the mountain bike race starts on August 24th 2019. For more details just click https://albergadler.eu. You can be sure that the winter sport season in Austria never ends for its fans. And the choice for them is so wide. Some may want to go on a ski safari trip with 50km long route. Its natural rival is the snowboard contest called BOARDER X , promising to be challenging and extreme. But the absolute favourite entertainment among freeriders, freestylers and racers has been and will always be Boarderspark Giggijoch with all its trampolines, walls, high jumps, rails, you name it. Another event that takes place every year is Electric Mountain Festival in whose line-up are the names of the most famous DJs worldwide. Koloman Moser is a famous artist with an original and unique style in many genres such as painting, interior design, scenography and black and white drawing. He is rightly measured on the same scale as the iconic artists Gustaw Klimt and Josef Hoffman. He was famous for achieving unity and wholeness - Gesaentkunstwerk, followed by the Venetian art nouveau. Collected are more than 600 of his works. The magnificent garden with the café and the restaurant offering exquisite delicacies makes the visit there even more desired and enjoyable. As for the presents for your dearest people, no room to worry- MAK Design Shop has a large display of young and unconventional artists' works among which you will surely find your present. The light installation Maklite by the American artist James Turrel is a majestic light composition illuminating the historic facades in the area of the museum and all the exterior around. The museum with its modern and futuristic ambience is an ideal place for artists, architects, designers and hard-core fans'meetings. Works by the German virtuoso Albert Durer can also be enjoyed from 20.09.2019 to 06.01.2020. After long and exciting journeys and tours one might desperately deserve to indulge in some nice food. 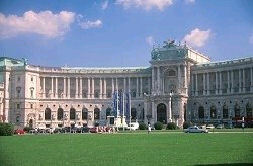 Here are some tips for culinary delights in Vienna as well as places for gifts and other memories. Viener Naschmarkt is one of the hugest outdoor market in Vienna. Its 120 stands offer fruits, sweets and diversity of delights from India, Vietnam, Greece -you name it. But not only that, its numerous venues host variety of events. Brunnenmarkt in Vien-Ottakring is also known by the name The Oriental Bazaar. It has been around for good 230 years now. Displaying the rarest and most exotic ingredients its stalls represent the clourful palette of Austrian emigrants' culinary tastes. It is quite worth having a trip to the market and immersing in that unknown culture. 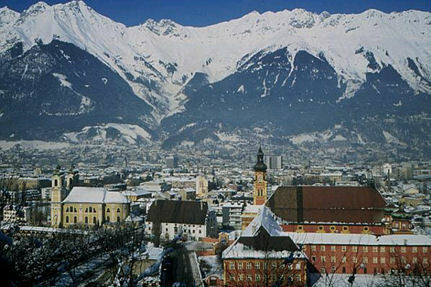 For accommodation matters click: https://www.austria-trips.com/hotels.htm. Austria is located in central Europe and is a country with impressive landscapes: from the Alps, which occupy 70% of the territory, continuing with hills covered with vineyards and ending with crystalline lakes that mirror the peaks in zapezite. It is a cultural land with a great love for sports and fine arts. 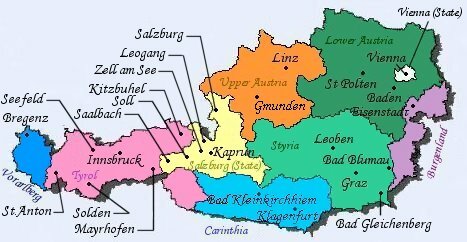 Austria alarms tourists towards itself during the winter. The main source of attractions are large and perfectly prepared slopes, modern cable plants, Ski bars with an atmosphere that cannot be easily forgotten. Austria manages its tourists with a number of resorts for lodging and resting and snowy mountains with mystic and magic for their thirst of adventure. Anyone misses the senazatia hot tubs after skiing the whole day, has lost one of the most wonderful and soothing feeling in life. Austria is actually "Mecca" for skiers and snowboarder lovers. They have some of the finest ski resorts like Ischgl, St. Anton, Saalbach, Solden, Kitzbuhel, Kaprun, Hintertux, Obergurgl in the Otztal Alps and many more. Year after year there has been an increased rate of tourist who comes for the ski season. The slopes of the Ski Mountains are marked with different colours to indicate the different difficulty phase. It is mainly done for the beginners, as they shall not get themselves in trouble. Blue colour is given for the beginner's slope with 90 kms and red colour for intermediary skiers with a slope of 95 kms. The black slope has a distance of 15 km and is used by advanced skiers. Austria has got skiing schools and best instructors known for their expertise among the world. Austrian ski team were the winners of the FSI ski championship 2011. The old telling of skiers and an extreme sport lover is still update: "Whoever climbs up on top of the mountain may get back finally to the valley." The Austrian Alps offer incredible opportunities for ski and spa holidays, single or family vacations, spectacular sights, exciting hiking and mountain biking tours. Some of the ancient towns in the country, known worldwide, are a magnet for travellers into cultural tourism. Browse a destination from our list that best suits your preferences or simply contact us if you need help choosing one or if you have any questions and need an advise about a trip to a particular destination.